The images below depict tin whiskers growing on the "bright" tin-plated copper contacts inside of a circuit breaker. Two to three years after deployment of these components into (terrestrial) service, the user began to experience field failures in multiple locations across Europe. 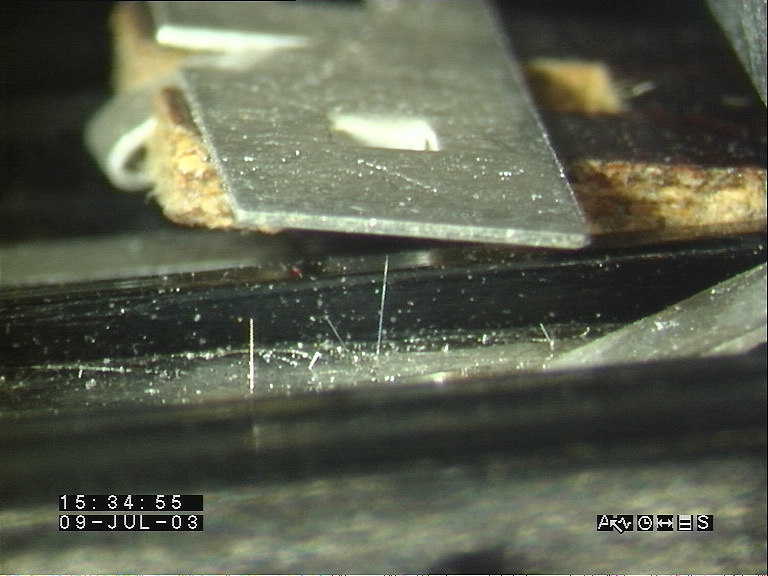 Failure analysis identified the root cause of failure to be tin whisker induced short circuits across contact pairs that are normally open circuit. During failure analysis the user observed that the density and length of whiskers were greatest in the areas of the contacts exposed to highest electric field in operation (i.e., between the separated contact pairs having 50V potential difference). Read More about this experience below. The procurement requirements for this circuit breaker specified the contacts to have "reflowed" tin finish over copper. Due to a purchasing/supplier error that spanned a period of ~2 years, the user received a number of devices (such as those depicted above) whose contacts were "bright" tin-plated, non-reflowed over copper. Within 2 to 3 years of fielding the "bright" tin-plated components, the user began to experience tin whisker induced failures. Field conditions for this component are typically air-conditioned spaces, but the component operates at 35°C to 40°C average due to its location within the equipment rack. During normal application, there is a 50V bias across the open circuit contacts. 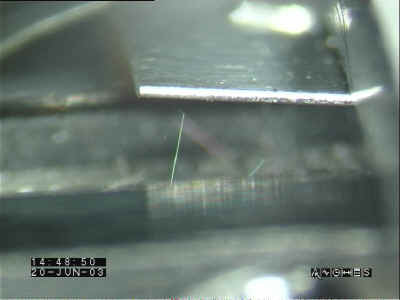 In the "biased area" where the electric field is highest, the tin whisker lengths reached in excess of 2 - 4 mm which is sufficient to bridge the gap between the separated contacts resulting is device failure. One picture shows a tin whisker that is bending where it is squeezed between the separated contacts. Tin whiskers were also observed in areas away from the biased region, but the density and maximum lengths were significantly less (~1 mm maximum) than found in the biased regions. 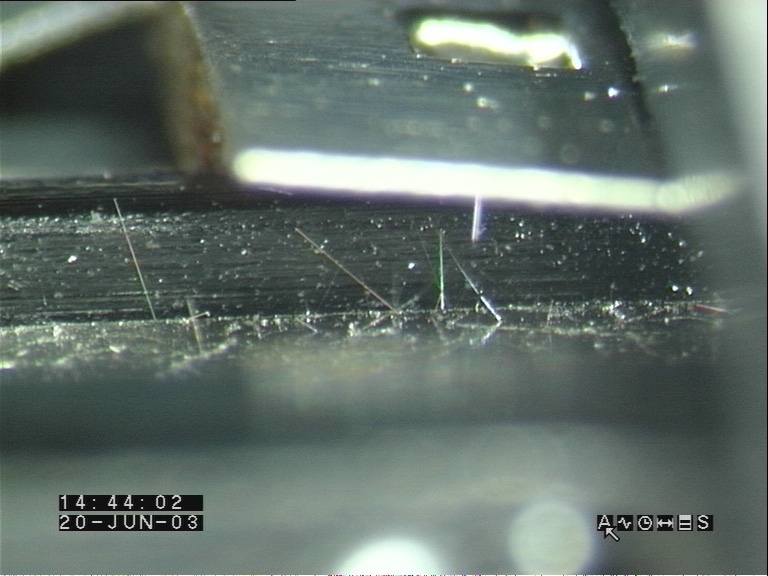 Tin whiskers were also found on spare parts taken from inventory (i.e., warehouse storage, unbiased) having the same lot date codes as the field failures. Whisker lengths for the parts taken from inventory were much shorter and whiskers were more randomly distributed (i.e., not more prevalent in the gap areas). 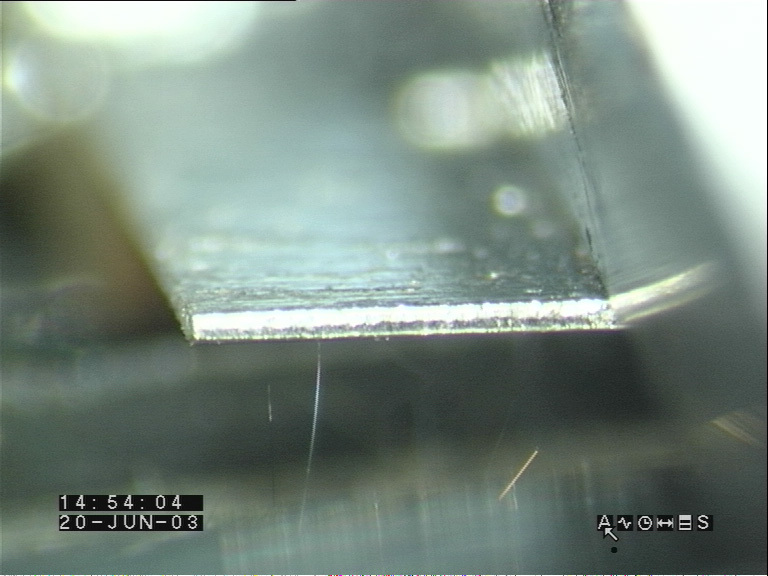 Based on observations 1, 2, and 3 the user postulates that electrical bias (open circuit) may have an accelerating effect on tin whisker growth especially for "bright" tin finishes. The user reports good field performance history (i.e., no failures) for breakers whose contacts were "reflowed tin finish" as originally specified. This website provides information about tin whiskers and related research. The independent research performed during the past 50+ years is so vast that it is impractical to cover all aspects of tin whiskers in this one resource. Therefore, the absence of information in this website about a particular aspect of tin whiskers should NOT be construed as evidence of absence. This material is presented to ensure timely dissemination of scholarly and technical work. For technical references posted herein, copyright and all rights therein are retained by authors or by other copyright holders. All persons copying this information are expected to adhere to the terms and constraints invoked by each author's copyright. In most cases, these works may not be reposted without the explicit permission of the copyright holder.